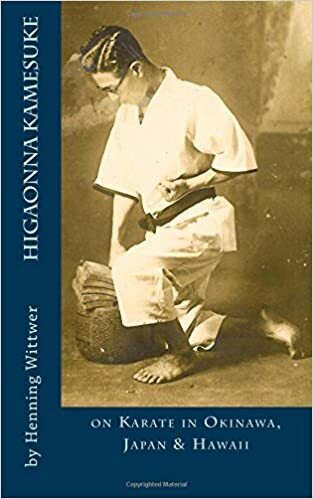 I’m currently reading Henning Witter’s English translation of Kamesuke Higaonna’s “Karate Stories” (good read). Higaonna was a student of Choki Motobu (Motobu stated he was his favourite pupil). There’s a bit in it that I thought could make for interesting discussion. Sanchin, Gojushiho (Useishi), Seisan, Seiyunchin (Seienchin), Suparinpei, Naihanchi (Tekki), Bassai, Chinto (Gankaku), Chintei (Chinte), Wanshu (Empi), Rohai and Kushanku (Kanku-Dai). In Motobu’s writing he lists the same kata as being practiced in Okinawa for a long time (in the same order). It seems that Higaonna is drawing on his teacher’s writings for information. However, Motobu has some additional observations and states that Sanchin, Gojushiho (Useishi), Seisan, Seiyunchin (Seienchin), Suparinpei are all Chinese in origin and are still practised there. However, Naihanchi (Tekki), Bassai, Chinto (Gankaku), Chintei (Chinte), Wanshu (Empi), Rohai and Kushanku (Kanku-Dai), while also of Chinese origin, are no longer practised in China. So Higaonna seems to have singled out Kushanku, whereas his teacher had a much longer list. Kushanku, at first glance, also seems an odd kata for both men to include seeing as Tode Sakugawa is largely credited with creating Kushanku kata. While Kushanku (the man) was Chinese, the kata he inspired was created by an Okinawan. The kata will therefore not have been practiced in China; even if the methods that inspired it where. This raises the possibility that Motobu is referring to system the kata encapsulates as opposed the kata itself? With regards to Wanshu and Rohai, both Motobu and Higaonna says that they were only practised in the Tomari area until the end of feudal payments (around 1879). However, Higaonna states that after that point they were frequently practised in Shuri and Naha too. Motobu, however, states that, thanks to the efforts of Itosu, Wanshu and Rohai are now (1932) widely practised. That’s quite different from inferring that Wanshu and Rohai organically found their way into “frequent” practise outside of the Tomari region. What’s interesting about all of this is that it seems clear that Higaonna is relying on his teacher’s information, but is more than a little slapdash when conveying it himself. I often feel that the past masters were less than rigorous when recording history; perhaps never anticipating that future generations - who will be much larger than ever imagined - would seek clarity and detail? Where there is consistency between teacher and pupil is the list of kata practised since “olden times”. However, Higaonna does not seem to have accurately conveyed his teacher’s thoughts on the kata still practiced in China; indeed, it is way off the mark and contradictory. All of this does show how quickly historical information can become twisted; even between a teacher and his favourite pupil. It also illustrates how little solid historical information we have to go on at times. Taken on its own, Higaonna’s writing could lead us to conclude there were known Chinese versions of Naihanch, Bassai, etc. being practised in the 1930s (something his teacher rules out), and that there was once a widely practised “naha-te” interpretation of Wanshu and Rohai (not what his teacher actually said). Being able to read Motobu’s work shows that what has undoubtedly happened is a failure to accurately communicate information. Interesting analysis, thanks for taking the time to write this up.